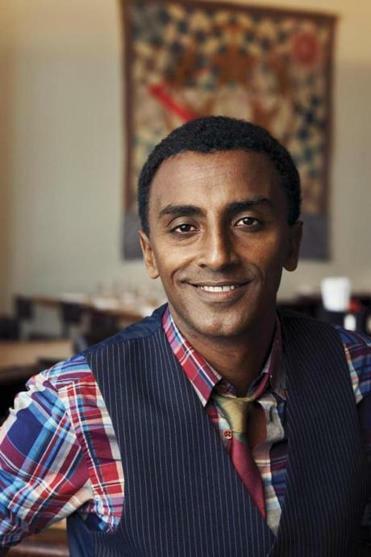 Chef Marcus Samuelsson has the flavors of many countries in his blood. There is the Ethiopian spice mix berbere, used by the birth mother he no longer remembers. There are the herring, pickles, and jams of Sweden, where he grew up with his adopted family, and the roast chicken that was the specialty of his grandmother, who inspired his love of cooking and gave him his first lessons. There are bisques and bearnaise sauce, learned in cooking school and the traditionally French kitchens where he cut his teeth. There are nori and curry powder and cilantro and jerk spices, tasted on travels around the world. All of these influences come together at his Harlem restaurant, Red Rooster, the synthesis of his career in food. Samuelsson chronicles his journey in an elegantly written new memoir, “Yes, Chef,” the reflexive response every restaurant underling learns to utter, no matter how tedious or difficult the request. It is a remarkable story, tracing his path from near death in a tuberculosis epidemic — his mother carried the 3-year-old and his sister 75 miles to an Addis Ababa hospital before she succumbed — to celebrity chef. It is a personal tale, about the bonds he forms with family: his Swedish parents, who just wanted children regardless of their color; the biological father he had long thought dead, whom he meets along with his half-siblings when he returns to discover Ethiopia; the daughter he fathered during a fling as a young culinary student, estranged for years. But more than anything, it is a tale of hard work. Samuelsson wanted to be a professional soccer player when he was young, and he devoted himself utterly to the sport. He was crushed when it didn’t work out. “I sometimes think of myself more as a failed soccer player than as an accomplished chef,” he writes. But he applies himself with the same devotion to his other love, cooking. He pushes himself through cooking school and into starter jobs and stages, or unpaid internships, in increasingly prestigious restaurants. Landing in New York, he joins the kitchen of Swedish restaurant Aquavit. And there, at the age of 24, he becomes executive chef, receiving a three-star review from The New York Times restaurant critic Ruth Reichl. He goes on to win a James Beard award, appear on “Top Chef Masters,” and create the Obamas’ first official state dinner (perhaps the president recognized some of their personal similarities). 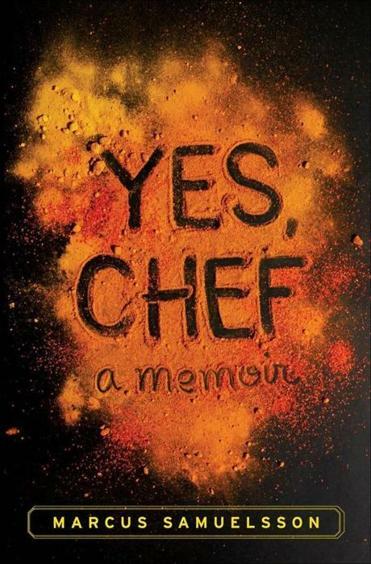 In his new memoir, “Yes, Chef,” Samuelsson details his journey as an Ethiopian orphan to his childhood in Sweden to a James Beard award-winning chef. In New York, he has his first experiences with diversity. Here, the color of his skin doesn’t register in the same way it does in Sweden. “[I]t’s important that you know that growing up black in Sweden is different than growing up black in America. I have no big race wounds,” he writes. Yet race is a recurring theme in “Yes, Chef.” There are times when Samuelsson is turned away from jobs because of the color of his skin. Chef Gordon Ramsay calls him a racial epithet. In fine dining, Samuelsson points out, black people are few and far between. He wants to change this, to make the kitchen a level playing field where anyone’s potential might be realized. For anyone interested in a career in the kitchen, “Yes, Chef” is required reading. It strips away any misbegotten notions of glamour that aspiring chefs may have gleaned from food television. Instead, it offers a model of how to comport oneself in the kitchen, with humility and endless effort — if one can hack it. A young Samuelsson used to vomit from stress at the beginning of every shift. The memoir also offers insight into how a chef thinks and builds flavors and dishes, as when a Massachusetts lobster roll inspires Samuelsson to roll lobster in thin-sliced Japanese pickled plums and serve the dish with homemade mayonnaise, bacon, and caviar. Samuelsson is an eternal champion of the flavors of the world, challenging the dominance of French cuisine. “Who’s going to make the people realize that food dismissed as ‘ethnic’ by the fine-dining world could be produced at the same level as their sacred bouillabaisses and veloutés?” he writes. Reading this, Red Rooster — where chili soft-shell crab, fried chicken, Swedish meatballs, and berbere roast chicken meet on the menu — seems an inevitability.